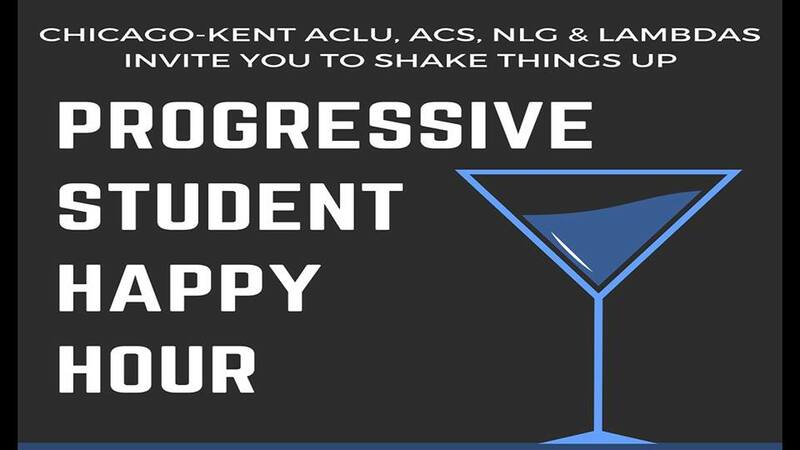 Please join Chicago-Kent ACLU, ACS, LAMBDAS, and NLG for a Progressive Student Organization Happy Hour at Dugan’s on Halsted! We have a wristband deal of $11 for all the beer and wine you can drink between 7:00-9:00 pm on Thursday, March 22 at Dugans! Wristbands will be on sale at the door at Dugans on March 22, or you can purchase them ahead of time Tuesday (3/20) – Thursday (3/22) from 11:00 am – 3:00 pm outside the third floor Spak! Part of the proceeds go to CHARITY. Are you interested in learning more about the progressive student organizations and advocacy on campus? Are you looking for ways to become more involved in progressive student orgs at Chicago-Kent? Are you interested in just drinking as much as you can for $11 in two hours? Then come drink with us and find out more about our organizations, our missions, and what we do at Chicago-Kent and in the Chicago legal community. Non-progressives welcome as well!